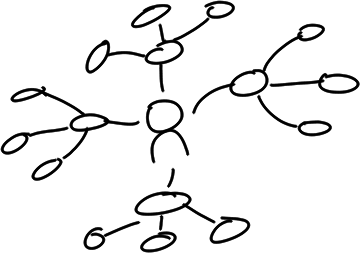 Marty Pauschke was interested in sketchnoting/drawing as a way of planning your own life. I find drawing to be really useful in making sense of my life and planning ahead, because it allows me to see the bigger picture. Here are some types of diagrams and visual metaphors that I use. I’d love to see yours! You can think of life as a journey. 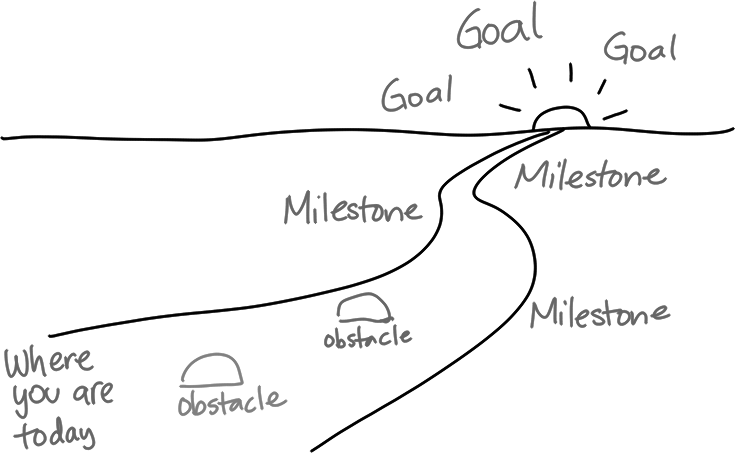 Imagine what the destination looks like, and think about the milestones you’d like to see along the way. You can draw obstacles and think about ways around them. This is great for celebrating your progress so far and seeing what’s next. Here’s another way to look at it: as a target that you’re reaching with an arrow. 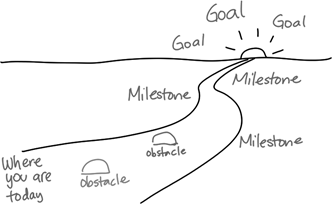 Sometimes it helps to think about the goal first, then work backwards: what needs to happen in order for you to reach your goal? What needs to happen for that to happen? Continue until you get to actions you can take today. Of course, life isn’t a simple journey – it’s full of decisions. 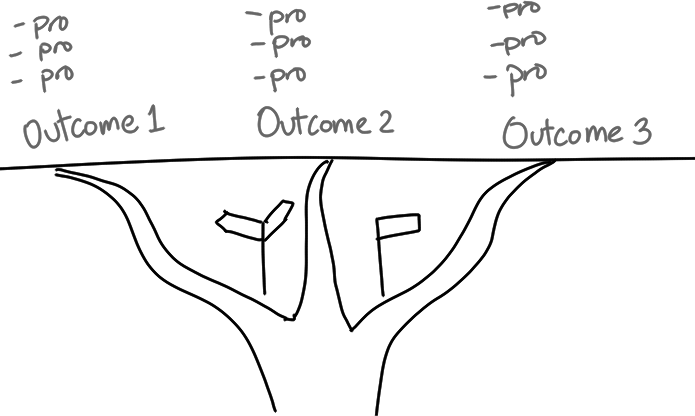 Sometimes it helps to think about what some different possible outcomes are, and what you like or dislike about each one. Then you can figure out what you’re leaning towards. 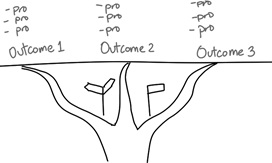 If you’re looking at multiple decisions, a simple diagram might be easier to make and read. 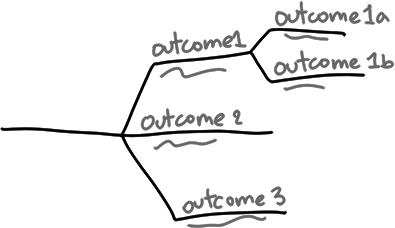 You can see the branching-off points and think about what information you need in order to make the best decisions at each stage. Great for branching out into detail. Example: Imagining the next five years and planning 2013. You don’t have to stick with having one central idea. Play around. Timelines are good for remembering because you end up filling in the blanks. I like making spiral timelines because they give me different amounts of space for things that are more important to me (ex: more recent memories). 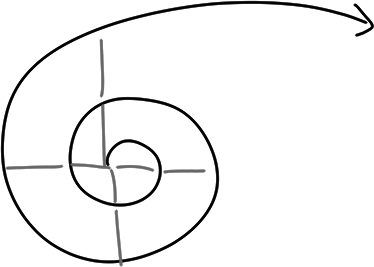 Spirals can go the other way, too – zeroing in on a goal. 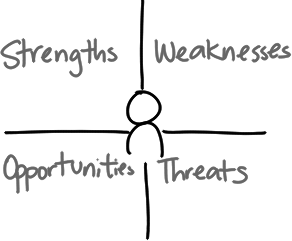 The SWOT analysis is used a lot in management schools and in consulting, and it’s useful for personal growth as well. I like focusing on my strengths and finding workarounds for my weaknesses. These are just some of the ways I use drawing to help me remember and plan. How do you draw your life?